If you are starting to plan out your Thanksgiving menu then this one is for you. I “real foodinized” an old family sweet potato casserole recipe that called for 2 cups of brown sugar…yikes! Why would sweet potatoes even need that much sugar when they’re already naturally sweet? Well, once you try this dish I think you’ll agree this “better for you” version is actually quite delicious and would be a great addition to any Thanksgiving Day spread. If you have the pleasure of serving an extra big crowd this holiday season then double the recipe! My “real” sweet potato casserole recipe for Easter was very similar to this. I find that it’s easier to bake the washed whole sweet potatoes first. Then, the skins just slide off and it’s so much quicker. Then, I always run them through my mixer to get all of the “strings” out and make them very smooth. Then, I proceed. Also, the topping and the filling both freeze well (separately). So, I make this ahead of time and then freeze it. Once it thaws, I cook the filling until it’s hot and almost done and then I add the topping so it doesn’t burn. Looks fantastic – I agree, sweet potatoes are already very sweet and don’t need a bunch more sugar! Sweet potatoes have such a delicate flavor. I find that boiling them makes them tasteless. Just throw them in the oven and bake them. I know you have to factor that into the prep time, but it is hands off time you can use to do something else. Lisa, I love your site and follow it religiously! This sounds great! Question…could you use coconut oil in place of the butter or do you think it would change things too much? It would definitely change the flavor, but you could try it! If you are dealing with a dairy intolerance you could try ghee (a.k.a. clarified butter) as well. Good luck! I’ve been trying lots of your recipes and really enjoying them. I will definitely try this soon. Thank you! Mark Bittman from How to Cook Everything also has a super-simple (and real) version of sweet potatoes that’s awesome. He grates the sweet potatoes first, then stir fries everything. It’s simple and quick, and my kids like it a lot. I don’t think they’d go for “potatoes” with marshmallows and tons of brown sugar. They’d wonder how they were even potatoes! This looks great! I agree that sweet potatoes don’t need a whole lot of sugar added, none most of the time, in fact. Maple syrup here seems like a good substitute for sugar. I’m not all the way “real” so this following part may raise some eyebrows… I got canned sweet potatoes that were packed in…get this…water! No sugar added! I did that for two years to make for my twin babies which saved a lot of time. But now they no longer make that variety. They are ALL packed in light syrup. :o( Bummy. But I think I’ll be trying this one with the real deal REAL soon! Trying to watch carbs, though, so I may toast the pecans in a pan and lightly drizzle with maple syrup instead of doing a crumble. I’ve been leaving the skins on for mashed sweet potatoes and I think I will for this casserole, too. I hardly notice them! I’m so glad you posted this; I was just really sad last week thinking about all the terrible stuff in sweet potato casserole, but now I don’t have to be! 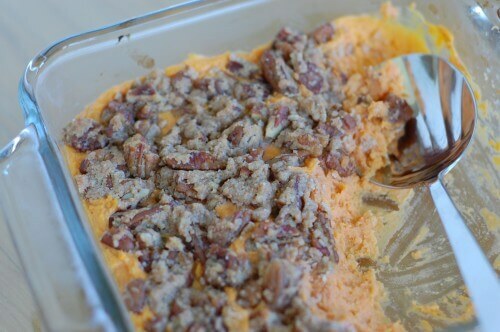 This sweet potatoe casserole looks amazing!! I am trying it tomorrow! This looks great. I love sweet potatoes, I often wonder why I don’t make stuff like this great casserole more often! I mean how is this that different than my other go-to side dishes? This would be especially nice for a Sunday supper! I love that you guys are doing this! We just did a 30-day Challenge with no processed foods! You are definitely inspiring me to continue the trend though! Thanks! I am doing the cooking for Thanksgiving this year and am trying to stick to healthier and organic options. This blog is a godsend. Thanks for posting this! I just completed the October Unprocessed challenge, and it’s really changed the way I am feeding my family. This looks like a fantastic side for Thanksgiving, and I plan to try it then! I’ve been following your site since you did the first 100 day challenge. I always find great information and inspiration here. Thank you! Yum! I made this a few nights ago, and it is great! I really felt good after eating it, too. I don’t know how to discribe it, but it’s something that I definitely noticed. Thank you so much for all of the fabulous recipes and Real Food tips! Thanks for this recipe…I plan on making it for our Thanksgiving dinner. Thanks for posting this recipe. I look forward to trying it. Do you have any replacement ideas for the pecans? I (unfortunately) am allergic to all nuts. You could just leave the nuts out all together or try a different nut or even a cracker topping. I have some sweet potatoes that need to be used and was thinking of making this tonight along with the crockpot chicken recipe…..do you think I can sub almonds for the pecans so I can avoid a trip to the store?? Thanks for all the great recipes!! You could definitely make that substitute…good luck! I tried this today for a work potluck with lots of dishes and lots of people. It was half finished. I asked for honest feedback (from folks not committed to a “real foods” lifestyle) and got “not sweet enough.” So not sure it will work for the big holiday. My hubby will pronounce final judgement tonight. I do like it since it’s not overpoweringly sweet. I wonder if honey would work as well as the maple syrup? Danyelle – I plan on making this for my son’s Thanksgiving lunch at his school tomorrow. I just found out that I couldn’t use the pecan topping because of kids with peanut allergies. Your streusal topping will be a perfect substitute! That’s so much! Making this tonight using spelt flour in place of wheat. Yum! I already have the sweet potatoes baked. This recipe is awesome! I didn’t have unsalted butter, so I subbed one TB of the butter with olive oil in both the potatoes and the topping (and reduced topping butter/oil to 3 TB). Also, I couldn’t find organic sweet potatoes at my grocery store, so I used organic yams instead. My 14-month-old very enthusiastically ate this. Next time I make it, I’ll try honey instead of maple syrup. Thank you for all the great real food! I just made this today, it was soooooo good. I’m not doing wheat flour so I just threw some whole raw pecans, maple syrup and melted butter in my food processor and pulsed until the nuts were chopped then spread it over the top. It was really good, thanks! I made this tonight for our church Thanksgiving tomorrow. I found out I was lactose intolerant (after lots of stomach problems) so I made this dairy free. I used Lactaid milk and Earth Balance spread. Not as “real” as butter, but I have no other choice. I think the majority of my problem was butter. But it turned out amazing! And I know I will have at least 1 thing I can eat tomorrow with no worries. Love it!! Ghee (a.k.a. clarified butter) is another product to try for those with a dairy intolerance…. This looks great – I’ve been looking for a maple syrup/pecan sweet potato recipe and this looks perfect. I’ll be trying it out tomorrow! We made it for Thanksgiving and it was sooo good! Thanks for the recipe! I make a dish that’s similar but add 2 to 3 Granny Smith apples cut into chunks. The tartness of the apples plays well with the sweet potatoes. I am going to make this and sub 1/2 cup of the pecans for one half cup of shredded coconut for the topping. I also like the idea of using a little oatmeal in the topping. Have you ever made individualized portions of this and frozen it for school lunches? Made this last night and loved it! I substituted almond milk, because I have a milk allergy. I thought it tasted wonderful but my husband said it was a bit dry. Any suggestions for making it more moist? We made this on Saturday for a “pre-Thanksgiving” Dinner with friends! IT WAS SO DELICIOUS!!!!!!!!! We really enjoyed it!!!! Plus, the leftovers the next day of this were amazing!! I really enjoy your blog and thank you for this recipe! We made a few small adjustments to the recipe, if anyone is curious. 1. We didn’t put the topping on top so it was nut-free. Instead, after we put the mixture into the casserole dish, we drizzled a thin layer of maple syrup on top (and spread the syrup over evenly on top) before putting it in the oven. This worked out really well and gave the perfect amount of sweetness, for anyone who is looking for a nut-free alternative. 2. Don’t be afraid to increase the sweet potato amount. We used likely 4 pounds of sweet potatoes (we were feeding a large group) but we kept all of the other ingredient amounts the same. It tasted great and was sooo yummy! We were glad we decided not to increase the proportions of everything else! Just made this tonight for Thanksgiving- I’m hoping I won’t eat it all before tomorrow! :)Thanks for the recipe! I made this for Thanksgiving this year instead of the sugary one I usually make and got rave reviews. I’m so glad I found your recipe! I tried your sweet potato casserole for desert this year for Thanksgiving and it was a hit! Thank you! Next time, I think I’ll do yams instead since we happen to like them more. The only thing we did different was the topping. We did butter, oats,brown sugar (I used coconut palm sugar), cinnamon, and nutmeg. It was delicious! I have a nut allergy, could I just make it without the pecans, or is there something I could substitute? thanks! Is honey an ok substitute for maple syrup? I have noticed that several other recipes also call for maple syrup. You should try adding shredded coconut to the topping, it is like heaven on a plate! If you double this recipe, do you bake it in a 9×13″ dish? Hi there! I am planning to make this for Thanksgiving. Do you think I could make this the day before, minus the pecan topping, refrigerate and bake with the pecan topping on Thanksgiving day? Hi! I am making this for a potluck tomorrow and was wondering, do you think I could mix everything up after cooking the potatoes and cook in my crockpot for an hour or so (on low)? I was going to toast the pecans and add on top. Thanks! Can you clarify the amount of butter to be used in this recipe? It lists 3 tablespoons and then 4 tablespoons as well. Thanks! The 3 TBSPs is for the main dish. The 4 TBSPs is for the topping. Hello! Would coconut oil and soy milk work instead of butter and milk? We have nut allergies in our house, can you recommend a different ingredient for the topping? Made this today and it was DELISH!! For the topping I used soaked, dehydrated almonds (I didn’t have pecans), half butter and half coconut oil and, instead of whole wheat flour I used about 2T coconut flour. It was wonderful! YUM!!! this has just the right amount of sweet mix with savory, this recipe will be added to the Thanksgiving recipes! I’ve noticed lots of your recipes call for unsalted butter, particularly the biscuits and this dish. As an inexperienced baker, I was just wondering why it needs to be unsalted? Is it simply to cut the sodium content of the dish or is there another reason? I really love your blog and am learning so much! Thanks! How about almond milk instead of regular milk? This was great! My family is used to the “old” recipe with the 2c brown sugar and two sticks of butter (yes, really!! ), but they ate this right up! My husband commented that it wasn’t as sweet as it usually is, but he ate two servings. :-P I used walnuts instead of pecans since that’s all I had on hand. Is there a substitute for the topping due to a nut allergy? I have a version from the Barefoot Contessa from many years ago that uses apples as the topping. That might work as a substitute for the nuts for you. Cut up 1-1/2 apples into wedges or 8ths. Melt some butter in a skillet and add the apple wedges and a little bit of maple syrup. Then lightly brown the apples wedges. Then place them on top of the sweet potatoes. FYI this recipe is actually for yams not sweet potatoes! I never knew the difference until we moved to the Northwest! Sweet potatoes look just like baking potatoes but they are sweet. 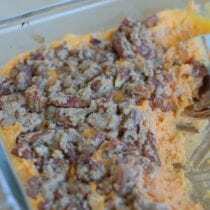 Sweet Potato casserole actually uses yams which are also sweet but an orangish color. I personally like the flavor of yams better than sweet potatoes so I am also so disappointed when I ask my Hubby to pick up sweet potatoes for dinner and he takes me literally and buys sweet potatoes and not yams. Sweet potato casserole is just not the same! Just made a trial run of this for Thanksgiving. It is wonderful! Thanks for a great recipe! Hi…I noticed that this recipe and many others call for butter…any recs for my lactose free husband? Thanks! Hi Jennifer. Our typical dairy free sub for butter is coconut oil. We’ve not tried it in the recipe, however. Has anyone tried a dairy-free version (due to allergies)? Will the topping come out right if I use margarine instead of butter? Anita, you can probably leave out the butter in the sweat potato mixture and used oil to mix in with the pecans. I used 2 T. of butter when I made this casserole and it was plenty- I would use the same amount of oil. This was awesome!! I think I used more sweet potatoes than the recipe called for. I also used about 1/2 the amount of butter. I hosted a holiday party with tons of food and this was everyone’s favorite dish. Thank you for remaking this classic. What gluten free flour could you sub for this recipe Almond flour? Also could you sub Stevia for the sweetener if so how much? About how many cups do 2 medium to large sweet potatoes yield? I would like to try this with butternut squash (family members have potato allergy), but not sure how much butternut squash to use. Thanks! Well, I’m not sure about everyone else, but my sweet potatoes yielded about 1-1 1/2 cups apiece when diced. Hope that helps. This is so delicious. Would be great with ice cream or whipped cream! Hi Ashley. I think either would work. Any suggestions for a nut free topping? Hi. You could try pumpkin seeds prepared the same way. Help!! I made and had to triple the recipe but it is too runny! I havent baked yet what can i add to mixture to thicken it up? Oh dear. Sorry, were you able to fix it? Tripling the recipe is not something we’ve done. My sweet husband ran to the store and bought me more sweet potatoes:) I was not sure if flour would mess them up! Thanks! This is one of my favorite recipes and I am not usually a sweet potato fan. It is June 2nd and I am making it today so I can eat through out the week! With dairy free options it makes a great meal(or several!) for me. YUM!!! I don’t normally like sweet potatoes as a casserole because they are so sweet. I just tried this for a Sunday dinner side and it was delicious! My 4 year old said it was good but didn’t really eat it. However, the next morning I used the leftovers to make pancakes. My 4 year old devoured them and said he LOVED the maple pecan pancakes. When I told him they were from lasts nights potatoes he thought it was funny that there were potatoes in the pancakes. Great recipe, two meals! What size pan will I need for this casserole? add a little molasses , makes it surprisingly “Wow” that’s so good! Can I use yams instead of sweet potatoes for this dish?